Before you take time contacting us for help, please check our Frequently Asked Questions below, as the answer to your question is probably there! If you're still stuck, use our Online Chat to contact us and we'll be happy to help, you'll see in the bottom right corner. Who or What is Mobile DJ Network? MDJN/ Mobile DJ Network and Photoboothmembership is a network of Entertainers who share a common interest in raising their profile and professionalism, through gaining affordable PLI and networking, while gaining more work through our listing services. If you've forgotten your password, on the login page, there is a link just under the login box to reset your password. If the system reports the email address doesn’t exist, then you are trying to get the reminder using a different email address than you registered with us. Use the Online Chat button on the bottom right of your screen to ask us to change your email address. Yes you can, you can use the Paypal or Stripe links, both offer payment by card, this then automatically activates your membership and insurance. If using paypal, when you get there, just select ‘pay by credit/ debit card’ or ‘checkout as guest’ instead of logging in to paypal. Sorry, we have no facility to take card payments as this would increase our overheads and then your membership costs. Once you’ve paid, just come back to www.mobiledjnetwork.co.uk or photoboothmembership.co.uk login and click your Dashboard! We do not email or post your policy. Yes you can, but not through us AND you will pay far more than £29.99! So the answer is to take out our Membership with built in PLI, which covers you for that one day AND the other 364 in the year! The broker is Hencilla Canworth, the agent that brokers most of the PLI entertainer policies. The Insurers are Royal & Sun Alliance Insurance plc, AIG Europe Limited, Aviva Insurance Limited, Covea Insurance plc. Yes! The policy covers you for £10 million Public Liability Insurance, includes £10 Million Employers Liability Insurance and cover for Dry Hire of equipment and is exactly the same type of policy as others are offering, but cheaper! The Membership and therefore Insurance covers ONE person. If you and a partner work together then you only need one Membership/ Policy, if you work at different gigs, then you will need two Memberships/ Policies. The same applies to Companies, Agents, Multi-Ops etc. Yes, just as you would expect with any type of insurance (Car, House, Pet etc. ), ours is the same as other PLI policies, and these exclusions are clearly explained within the full policy document, do have a read! Where do I get a link for my Website? Many of our Members like to have a link on their website which shows their Membership of MobileDJNetwork or PhotoboothMembership, with a link to their PLI. There are a couple of ways to do this, depending on your ability with editing your website. Paste that code into your website on the page where you want it to show, then replace INSERT YOUR 5 DIGIT CODE HERE with the last 5 digits of YOUR MDJN Number. You should end up with https://mdjn.uk/details/pdf.php?id=yournumber", anything else and it won't work! Can I link to the MDJN Website and my PLI? 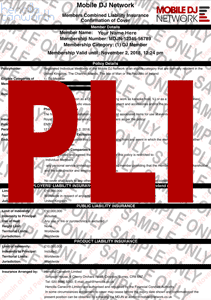 How do I link to my PLI or send a Venue my PLI? You could use one of the code samples below in your signature, then the logo will be there and clickable! Where can I see and download the Full PLI Policy? If you can't use that for some reason, then you can email admin at mobiledjnetwork dot co dot uk (written that way so we avoid spam). Our registered company address is 24 Downsview, Chatham, Kent. ME5 0AP. We do not take personal callers at this office. In an emergency, and we do mean an emergency not just 'how do I apply', 'how much is it', 'can you reset my password' as these are all covered here in the help section above, then you can call 07711 573 276 during normal business hours.